Hello there stranger – my name is Betsy. Have I ever seen you before? I don’t think I have. I don’t like strangers much, but Gus assures me that this inter-web thing is quite safe for rabbits. He says, “on the Internet, nobody knows you’re a rabbit!” Well, we’ll see, Gus. We’ll see. 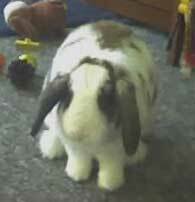 I’m still getting used to living indoors – I used to live outside in a hutch, near my rabbit mom and dad. But these days I’m inside all the time with Gus and these two big people – my human mom and dad. It’s pretty nice here – I especially enjoy being under the bed – but I still don’t think there’s enough places for a rabbit to hide. Though maybe that’s just me. For some reason I have the nickname “Destructo-Bunny.” I don’t really know why. I may have chewed a few things in my time, but I’m a rabbit! That’s what rabbits do! I don’t know what all the fuss is about. Oh – I think someone is coming; time to go back under the bed! Bye-bye!